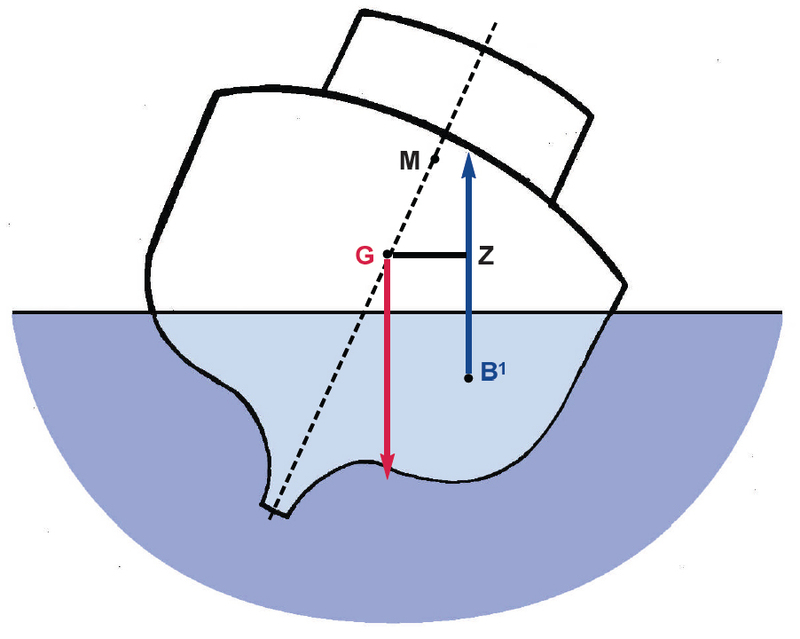 When heeled by an external force, the vessel’s centre of gravity (G) does not change. The force of gravity acts vertically downward through the centre of gravity (G). The centre of buoyancy (B), being the geometric centre of the underwater section, has moved to a new position B1. The force of buoyancy, which is equal to the force of gravity, acts vertically up through the new centre of buoyancy (B1). The horizontal distance from the centre of gravity (G) to the vertical line from B1 is measured in metres and is referred to as the righting lever (GZ). Therefore, the force involved in returning the vessel to the upright position is the weight of the vessel acting down through the centre of gravity (G) multiplied by the righting lever (GZ). This is referred to as themoment of statical stability. The vessel’s centre of gravity (G) has a distinct effect on the righting lever (GZ) and consequently the ability of a vessel to return to the upright position. The lower the centre of gravity (G), the bigger is the righting lever (GZ). Should the vessel’s centre of gravity (G) be near the metacentre (M) the vessel will have only a small metacentric height (GM) and the righting lever (GZ) will also be a small value. Therefore, the moment of statical stability to return the vessel to the upright position will be considerably less than that of the previous illustration. Stability curves (GZ curves) are used to show graphically how the stability lever (GZ) changes when the vessel is heeled. (c) the point of vanishing stability. The shape of the righting lever curves, the metacentric height (GM) and value of the righting lever (GZ) are dependent on the form of the vessel and its loading. In this regard, the freeboard and the ratio between the vessel’s breadth and depth are very important. Raising the vessel’s centre of gravity (G) causes a decrease in the metacentric height (GM) and thereby smaller values of the rightin levers (GZ). 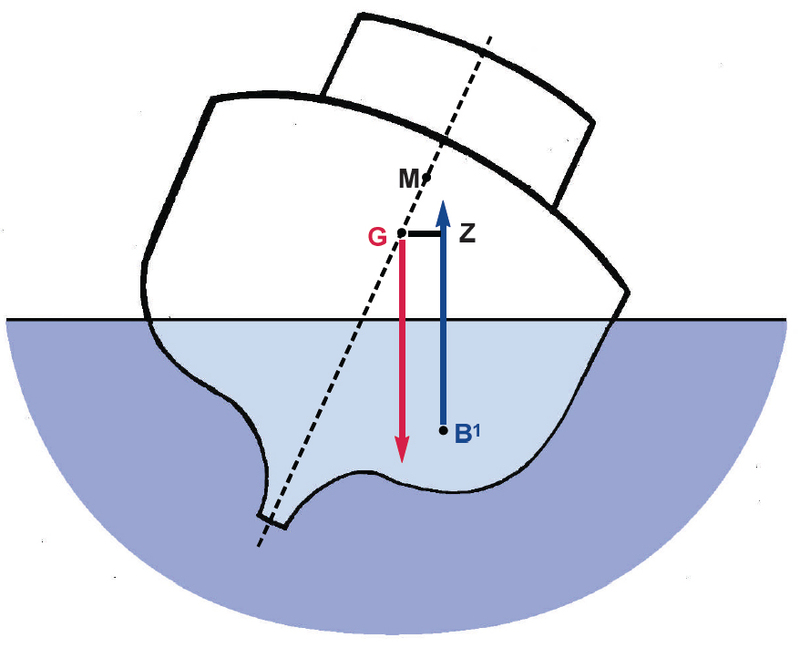 If the vessel’s centre of gravity (G) is above the metacentre (M), the vessel is in an unstable equilibrium. The vessel has a negative GM and is not able to float upright. Either the vessel will capsize of or float at an angle from the upright to one side. By loading less the vessel will have more freeboard and the values of the righting lever (GZ) will be higher. The point of vanishing stability will also be higher, i.e. the vessel’s ability to return to upright after having been heeled to large angles of heel is better. Various design of vessels leads to various characteristics of their stability. Increased breath will result in higher values for metacentric heights (GM) and righting levers (GZ). 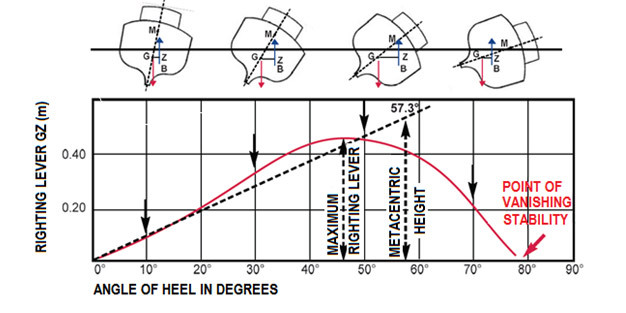 However, the point of vanishing stability will be less and the vessel will capsize at a smaller angle of heel.